Walking into the dark, cavernous space of the gallery the atmosphere changes and the sound of footsteps echo loudly. There’s nothing on the walls and rather ominously, toward the back of the space, is a large mound lit with a single spotlight, protruding from the floor. Well, not really protruding from the floor. It is the floor. Surging upward, the paved bricks curve and rise as if a great force bubbles below the surface. The rest of the gallery space is completely empty. In fact, the presence of this rising floor amplifies the absence of other objects in the space. One is compelled to look around in search of some sort of referent, some sort of handle with which to get a grip on what’s happening, but alas, it’s just you and the mound. And that single blaring spotlight. What is going on down there, under the bricks? Is something hiding or is something trying to get out? Walking around the mound just triggers more questions. Could I stand on it? Is it actually the floor, elevating upward, or something more artificial, overlaid on to the floor? All the while the sense of being in the space, being present with this form, is ever more apparent. And it’s this impact on the body, this increased awareness of your own self that is the potency of this piece. You pull your eyes away to look around, adjusting to the dim light, and then like a gravitational force they get pulled back to the mound as you circle it, wondering. Waterhouse has produced a compelling installation with Floor. It delivers both a physical reaction and stimulates a conceptual one. 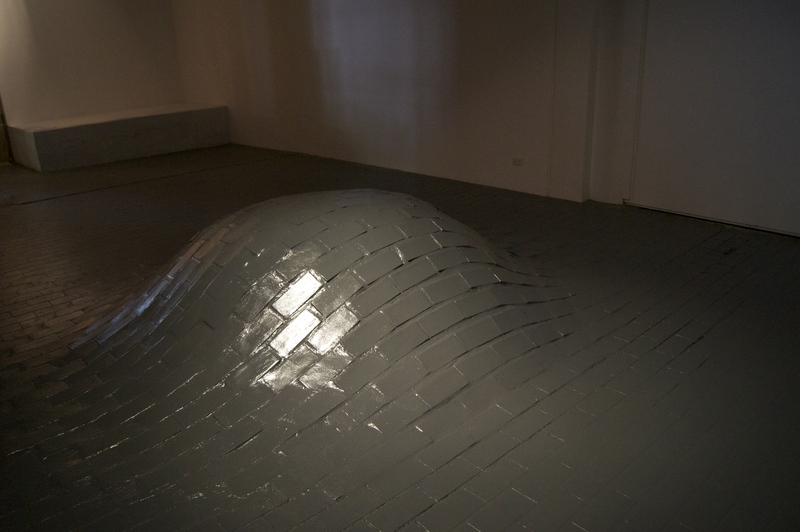 Executed with the high quality craftsmanship of materials he has built a reputation for, Floor is able to penetrate its way into your thoughts in the same way it penetrates its way into the gallery space. Representing a development in his practice by taking his sculptural approach into a new of territory of psychologically evocative installation, the work hints at the autobiographical. A space devoid of discrete art objects begs the question – where is the artist? Given that Waterhouse is responsible for establishing the gallery and has had to battle with the work of promoting other artists in it while pursuing his own practice, you get a sense of the complex relationship he has with this space. A partner piece to the installation is a photographic work, Indent, which sits almost covertly on the entrance wall, only noticeable on the way out. The image is of a sculpture – a perfectly spherical indentation in a wall. Approaching the image, the indentation appears as if it’s a sphere, floating in mid-air against a flat background. It looks like an image of an object. But it’s not an object, it’s the opposite of an object – it’s an absence. As you move closer to it you can see what it actually is. This confusion over whether it’s an object or an absence highlights that, of course, it’s none of those things. It’s a flat panel of colour, a digital print on paper barely thicker than a human hair, mounted on crisp, thin metal. It’s an illusion of an allusion. These oscillations between opposites – object/absence, hiding/erupting, indent/protrusion – are cleverly considered and deliver a wonderfully produced body of work.